The women suffrage movement in North Carolina began in 1894 with the formation of the North Carolina Equal Suffrage Association in Asheville. Association president Helen Morris sought a state amendment extending the vote to women, and Senator J. L. Hyatt of Yancey County introduced a bill to this effect in the 1897 legislative session. The Senate leader, however, reflecting the sentiment of his colleagues, referred it to the Committee on Insane Asylums, where it died. Little was attempted or accomplished during the next 15 years. The state's women suffrage movement lay dormant, as it did in much of the rest of the nation. The movement revived in late 1913 with Gertrude Weil's formation of the North Carolina Equal Suffrage League in Charlotte. Weil, a Smith College (Massachusetts) graduate, was the daughter of a German Jewish immigrant who had settled in Goldsboro just before the Civil War. She was one of the South's "new women" who had acquired some postsecondary education, participated in a range of club activities, and enjoyed paid working experiences as the region began to modernize. The Equal Suffrage League helped develop local groups while lobbying legislators and publicizing its cause through pamphlets and speeches. In 1915 Lilian Exum Clement of Asheville started a branch of the Congressional Union, later renamed the National Woman's Party, a more militant group determined to obtain suffrage through a federal amendment. Still, the 1915 legislature voted down all attempts to grant women the vote; representatives from the agricultural counties with the largest African American populations led the opposition. Much of the controversy over women suffrage concerned race: antisuffragists feared that allowing women to vote would increase pressure to reverse laws that prevented African Americans from voting. 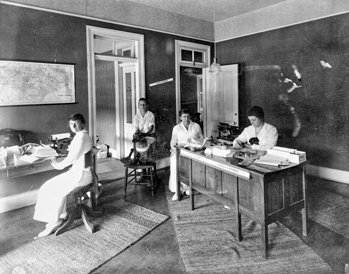 As they did elsewhere, suffragists stepped up their efforts in North Carolina after the outbreak of World War I, convinced that women's contribution to the war effort would compel President Woodrow Wilson and Congress to relent. But their activism gained little support in the General Assembly. Legislative initiatives aimed at allowing women to vote in the primaries, the municipal elections, or all elections were defeated as late as 1919. Suffrage activism, however, was more effective on the national stage. On 10 Jan. 1918 the U.S. House of Representatives approved the Nineteenth (or Susan B. Anthony) Amendment-with the affirmative vote of only one North Carolina representative, Edwin Y. Webb. In the Senate, North Carolinians Furnifold M. Simmons and Lee S. Overman joined the minority opposition in the final tally on 4 June 1919. Congressional adoption of the Nineteenth Amendment prompted antisuffrage organization in North Carolina in the summer of 1920, when Mary Hilliard Hinton of Wake County formed a state branch of the Southern Rejection League in Raleigh, assisted by the National Association Opposed to Women's Suffrage. The state's antisuffrage movement derived its strongest support from politicians eager to retain the control they had obtained after Reconstruction; the textile mill industry, which feared the impact of women's votes on child labor issues; and railroad officials, who worried that women would target them in the progressive attack on corruption in big business. Yet the Southern Rejection League in Raleigh was a small group of perhaps only 20 active members, although Raleigh men also organized the States' Rights Defense League at the same time. Moreover, North Carolina can claim the only southern antisuffrage journal, the State's Defense, but this too was a last-minute affair, published only four times before the ratification battle ended. In August 1920 Governor Thomas W. Bickett called a special session of the General Assembly to vote the Nineteenth Amendment up or down. President Wilson sent Bickett a telegram urging ratification, but the governor responded with the hope that Tennessee, then also meeting in a special convention, would relieve the pressure on North Carolina by being the thirty-sixth and final state to vote for ratification. Bickett nevertheless encouraged the legislature to ratify the amendment, arguing for a graceful accession to the inevitable. On 17 August the State Senate, by a vote of 25 to 23, postponed consideration of women suffrage until the 1921 session. After the Tennessee legislature had voted for ratification on 18 August, the North Carolina General Assembly met to consider the amendment the next day. Despite Tennessee's approval, the General Assembly still rejected the measure by a vote of 71 to 41, arguing that women suffrage would threaten the sanctity of the family, state rights, and white supremacy. With ratification a fait accompli and thus with nothing to gain nationally, legislators sought not to alienate the prevailing antisuffrage sentiment at home. Not until 1971 did the General Assembly of North Carolina endorse the Nineteenth Amendment. Elna C. Green, Southern Strategies: Southern Women and the Woman Suffrage Question (1997). Jane DeHart Mathews, "The Status of Women in North Carolina," in Lindley S. Butler and Alan D. Watson, eds., The North Carolina Experience: An Interpretive and Documentary History (1984). Kathryn L. Nasstrom, "'More Was Expected of Us': The North Carolina League of Women Voters and the Feminist Movement in the 1920s," NCHR 68 (July 1991). Anastatia Sims, The Power of Femininity in the New South: Women's Organizations and Politics in North Carolina, 1880-1930 (1997).